The best way to view & compare PDX packages - FREE! PDXplorer PDX Viewer opens and exports data from PDX files that conform to the IPC-2570 standards for Product Data eXchange (PDX). These standards specify how data is shared between supply chain partners. Product lifecycle management (PLM) applications often export PDX packages to manufacturing systems. The PDXplorer PDX Viewer offers a clean, straight-forward user interface, coupled with an adaptable data parsing engine. Since PDX files can occasionally have varying attribute values depending upon the IPC implementation, PDXplorer Viewer examines common format differences to determine how best to open the PDX file. PDXplorer is FREE for personal and organization use - view PDX files at no cost, securely on your own computer. 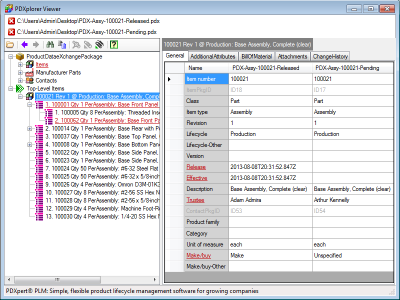 The PDXplorer PDX Viewer is a simple, user-friendly tool for viewing parts, multi-level BOMs, file attachments and other PDX design package data. It's a quick download, very easy to install, and displays helpful labels instead of the obscure technical names defined by IPC-2571. Compatible with Windows 32-bit / 64-bit, including XP, Vista, and Windows 7 / 8 (x86/x64). No cloud/SaaS risk: Your intellectual property remains securely on your own computer — no third-party sharing, no waiting for large uploads to complete. Displays both a PDX detail view and, for each top-level assembly item, the multi-level bill of materials. Compare PDX packages to see highlighted differences between two or more files. Flexible file export: Extract a single file as well as all files contained within a group (for example, all Item or all Manufacturer Part attachments). Full Windows Clipboard support: Copy any grid, row, or cell. Text search of object names and/or property values. Back/Forward buttons and "top level" items are identified for easier navigation. Optimized for use with PDXpert PLM software, and will extract PDXpert data extensions like MRP and Custom attributes. * Your computer must have an appropriate viewer for the file format, e.g., Adobe Reader must be installed to view PDFs. A list of free CAD file viewers is available on the PDXpert PLM software website. Copyright © Active Sensing, Inc. PDXplorer™ & PDXpert® are trademarks of Active Sensing, Inc. All other trademarks are the property of their respective owners.